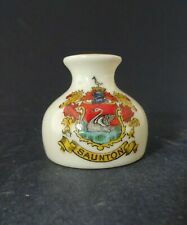 VERY SMALL SHAPED VASE CRESTED CAPEL BY ARCADIAN CHINA COIN IS A 5p. APPRO X2 INS 5 CMS TALL. On base is the Arcadian trade mark. on front is the coat of arms of St Albans. 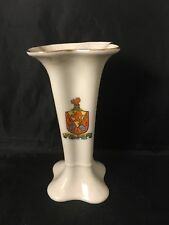 Arcadian Crested China - Vase - Lyndhurst. The Velvet Marionette. City of Exeter crest. CRESTED CHINA. Indistinct makers mark to base. Arcadian Crested China. Rarer Crest. Irving. Vase. Arcadian Crested China. 6cm tall approx. Marked on base with Arcadian back stamp. For sale in UK only. Despatch upon receipt of funds in account. Tewkesbury Abbey crest. CRESTED CHINA. 'Stoke on Trent' Arcadian stamped on the base along with the number 20 in orange. 6.5cm high x 3.5cm wide at its widest point. Arcadian Crested China. Littlestone on Sea. 4.75cm tall approx. Marked with the Arcadian base stamp. I will send overseas if required. Antique roman style /copy of a vase possibly Victorian? This is old and used so may have imperfections ,i am not an expert so sold as seen. Arcadian Crested China. The vase is styled on a Roman vase found in Chester. Chester Roman Vase. Kensington Souvenir. Arcadian Crested Ware Vase - Birmingham Approx 5.5cm (h). Steel & co. 40 New Street Birmingham Pre-owned. Good condition with firing marks. New listingArcadian China Model of a Thistle Vase with Chard 1570 crest. I have for sale a piece of CRESTED CHINA by ARCADIAN. CREST -CHARD 1570. THISTLE VASE on STAND. Fabulous example of Arcadian Ware. 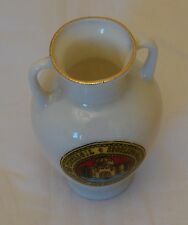 Arcadian Crested China Vase. Liverpool Crest. This item is in good condition. Marked underneath ARCADIAN CHINA. Ideal for any collection. To the underside is the Arcadian mark. Actual Images of item are shown above. Goods are security marked to prevent fraudulent claims. Waterfall Heraldic China to base. CRESTED CHINA. City of Hull crest. A WHITE MINIATURE TWO HANDLED VASE. WITH A PICTURE on the front. This item is in good condition. Maker GEMMA. Ideal for any collection. Arcadian China Model of a Thistle Vase with Chard 1570 crest.